This classic Easter treat is a combination of buttery, golden caramel and freshly roasted cashews covered in sweet Swiss milk chocolate. 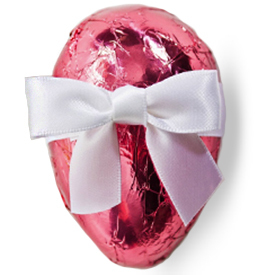 Dressed for Easter in pink foil and finished with a white bow. Caramel (Corn Syrup, Sugar, Milk, Fructose, Hydrogenated Coconut Oil, Butter, Mono- and Diglycerides, Salt, Soy Lecithin, Vanillin), Milk Chocolate (Sugar, Cocoa Butter, Milk Powder, Cocoa Mass, Barley Malt Extract, Soy Lecithin, Vanilla), Cashews, Salt.